Battling restless legs and fatigue? 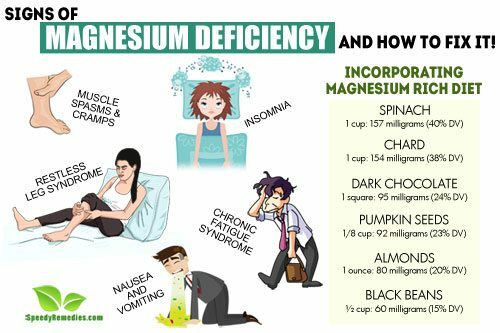 Did your doctor advise a magnesium deficiency test? No! Well, it is time you get yourself one done…! Yes, your body might be suffering from deficiency of magnesium (one of the most important minerals) and your doctors fail to realize this! Going by the facts, magnesium is one of the most important minerals in the body for ensuring the electrical stability of every cell. Not only is it more important than calcium, potassium and sodium (the essential minerals), but also regulates all of them. In fact, magnesium alone is responsible for more than 300 metabolic reactions in the body. Magnesium greatly affects metabolism, blood pressure, immunity and other aspects of human health. So, deficiency of this mineral can affect virtually every organ system in your body. Right from the brain down to your toe, any and every part of your body can be affected by the deficiency of this mineral. So, if you are facing any of these, it is time you feed your body with more of magnesium. If you feel sudden hardening and tightening of muscles that is extremely painful, then your body is probably being deprived of required amounts of magnesium. The muscle cramps usually happen in the muscles behind the legs (calf muscles) or in the foot. If you feel some sort of uncomfortable burning, tingling, creeping, itching or crawling sensations in the legs, it is sign that your body is facing magnesium deficiency. These sensations are accompanied by an uncontrollable urge to move the legs frequently. This causes restlessness and is one major reason behind improper sleep. Magnesium acts as a chemical gate blocker and prevents the rushing of calcium into the nerve cells. But, when the body is deficient of magnesium, the nerve cells become overactive, sending too much of calcium into the muscles. This causes constant contraction of the muscles leading to restless legs. Magnesium helps in calming and relaxing the muscles, thereby providing proper sleep to the body. Deficiency of magnesium causes stress and nervousness, which results in loss of sleep. One is unable to remain asleep or fall asleep for durations long enough to feel rested. Deficiency of magnesium in the body hampers with the proper functioning of motor nerves to carry electrical impulses from brain to the muscles, thereby sending improper messages, leading to improper sleep. Muscle pain, frequent headaches, sore throat, loss of memory, tender lymph nodes in neck and armpits or multi-joint pain without any swelling or redness are the signs of deficiency of magnesium in the body. Gastrointestinal disturbances, restlessness and pain in the upper part of the stomach accompanied by an urge for vomiting is one of the prime symptoms of magnesium deficiency. Aggression, anxiety, stress, depression, weakness, low energy, irritation, loss of appetite, brain fog/confusion, exhaustion, seizures and hyperactive reflexes are some of the common symptoms of magnesium deficiency in body. Irregular or rapid heartbeats, high blood pressure, nasal congestion or a pounding headache is the result of magnesium deficiency in body. Increased level s of calcium in the body is a sign of magnesium deficiency. Magnesium acts as a chemical blocker and allows only the required amount of calcium to pass through the bones and vessels. However, low levels of magnesium in the body leads to excess calcium in the muscles. This restricts transfer of proper messages from the brain to the arteries, thus causing improper functioning. Thus, one can witness blot clots and abruptions on the skin. Calcification may lead to several coronary disorders like heart attacks, strokes and other cardiovascular diseases. Vital to more than 300 enzymes in the body, magnesium deficiency can express itself in numerous ways. An important mineral in the body, the deficiency of magnesium requires immediate attention. However, oral consumption of magnesium is not an effective technique of ridding the body of its deficiency. When consumed orally, only a very small amount of magnesium gets absorbed by the body and the rest passes out through urine. So, there are certain other techniques of delivering magnesium into the body. You can use some of these to fulfill your body’s requirement of magnesium. One way to get rid of magnesium deficiency is to consume foods that are rich in magnesium content. Foods like dark chocolate and dried fruits, green leafy vegetables, fishes, nuts, seeds, beans, whole grains, bananas, yogurt, goat cheese, artichokes and avocados are rich sources of magnesium, hence, should be consumed as per the requirements. Oral supplementation is one not so effective way to cure the deficiency of magnesium in body. You can resort to oral magnesium such as magnesium citrate powder, or some dietary supplements to fulfill your body’s requirement of magnesium. However, this is a less effective choice because magnesium is not easily absorbed in the body and most of it passes out with urine. So, it should only be resorted to during rest hours. When consumed internally, most of the magnesium content is not absorbed by the body. Therefore, an even more effective way to get rid of magnesium deficiency is through topical application. This involves spraying of a magnesium solution on the skin. Magnesium penetrates directly into the tissues and blood, thus fulfilling the body’s requirement and the rest passes out through urine. Use 8-10 sprays of the solution on your arms, shoulders and legs. Leave it for about 20 minutes and then rinse off during shower. Epsom Salt bath is another effective technique to get rid of magnesium deficiency in the body. A post-workout bath in Epsom salt delivers magnesium sulfate to the body, which helps in recovery. Magnesium chloride is in fact even more effective than an Epsom salt bath. This has an extremely relaxing effect on the body and also helps in relieving soreness. You can dissolve 1-3 pounds of crystals or flakes of magnesium chloride in water for a relaxing experience and for a whole 500 mg delivery of magnesium to your body. Magnesium chloride oil massage is also an effective way for delivering the mineral into your body. Alternatively, you can also hop for a magnesium chloride footbath, in case you do not want to go for a full bath. Note: All the topical methods should be followed with moisturization of the areas where the solution has been applied. Topical spraying or use of magnesium solution may cause some tingling or burning sensation in some people. However, this is normal and usually subsides with frequent use.